It is difficult to assess this show as simply a show on the Stones� tour. By all accounts the tour is over, but still the Stones were here tonight front and center in Hong Kong harbor, with all of the spectacular skyscrapers as a backdrop. 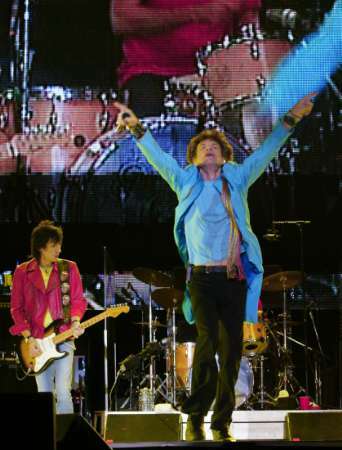 It made for a truly extraordinary evening, where the band who initially could not play here due to the disease SARS had a score to settle: from Mick carefully enunciating his Chinese welcome message to Keith joyfully declaring �Hong Kong�.finally!�, the evening had a purpose not present at most other shows on the Licks tour. The night was rich with the usual classics which have universal appeal, which really gave the show momentum. But also I was impressed with the variety brought in, from Angie to You Can�t Always Get What You Want to Paint it Black. 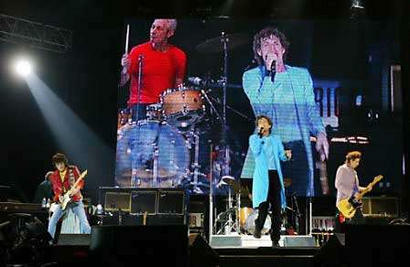 The Stones also played Miss You, which we had all grown tired of in 1997/98 but was a welcome treat this time around. Sympathy for the Devil, Gimme Shelter, You Got Me Rocking, and Street Fighting Man enabled Mick and Keith to get that critical momentum which always wins over the crowd., which worked perfectly in the small temporary venue that oddly enough seemed a bit like something you might see at a state fair in America. The crowd deserves much credit, as they were attentive and standing throughout, not using Keith�s songs as a toilet break. Judging from the people I spoke with after the show, it was a first time for many as Hong Kong is not on the usual Chicago/Detroit/Cleveland string of tour dates. To talk with someone in their twenties and here him say �Like seeing Jimi Hendrix or Jim Morrison or John Lennon, I SAW MICK JAGGER TONIGHT!� brought much of my appreciation back into perspective. The location, event, and venue were far from typical, and the Rolling Stones made it very clear that the band and its performance was in keeping with the evening�s theme. The warm-up show started at �round 1915hr, when only one-third of the seats filled, while the audience were queuing up for Carlsberg or finishing their super in nearby restaurants. Mick Gerace, a superb imitation of the King, did quite a number of Elvis golds, including �the Wonder of You�, my favourite, but the crowd didn�t seem to enjoy too much. The sound was somewhat uneven, and focus lost at times, as if the console was still doing sound check. The background vocal was the Sweet Inspirations, singing for the King. �The Suspicious Mind� completed the warm-up. Quite a good warm-up on the whole, but the audience seemed to booze and ignore clapping. The final set-up sound check by the Stones crew took slightly less than an hour. Ready, steady, stage lighting gone, entry passage aired, ear-splitting cheer from the crowd even louder, the opening chords of Brown Sugar were heard, and in less than a second, the full band appeared before the crowd. Darryl, has gained weight noticeably. Charlie, silvery hair, in red T-shirt, really swinging but never block the way of the others. Ron, no cigarette, no fooling around, he�s really serious on guitar and washboard. Keith, smiling, attire not quite in Las Vegas style this time. Mick, over 60? No, he is sweet sixteen. They were everywhere on the stage, so energetic. Start Me UP and IORR followed. The crowd put their hands in the air, clapping, feet on seats, tapping along with the beats. 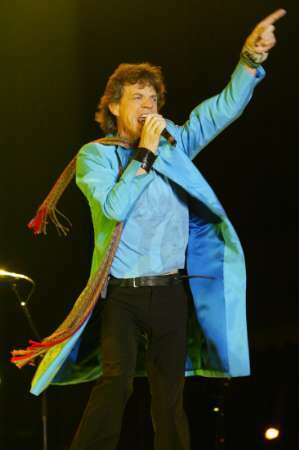 Mick thanked and chatted a little with audience in Cantonese. Fast learner of language. Angie, sung beautifully and in a lower key for part of the lyrics, with Keith on the acoustic. 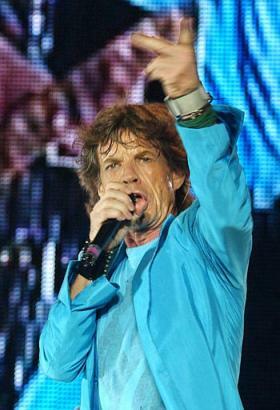 Mick asked the crowd if they really want to sing along with him before playing �You Can�t always Get what You Want�. Indeed everyone sang, �� but if you tried sometime you�ll find you get what you need��. �Miss You� used to be a break for cigarette for Keith and Ron, but this time they were in strict discipline, doing seriously to support the man in front. Bobby, simply professional on sax. Lisa was luminously charming this evening, in black long-sleeve blouse and tight light brown skirt, did a wonderful duet with Mick in Gimme Shelter. Slipping Away, sung tenderly by Keith; his voice was not coarse at all as many have said. Happy completed his part happily. CYHMK brought the Fest to its full height with Mick�s harmonica. SFM - Hong Kong is never a sleepy city. Even without the animation on the giant screen, Honky Tonk Woman is still a gem for the show. While everyone singing �gimme, gimme, gimme the honky tonk blues��, Mick doing kind of tango with Lisa. A local pop singer had a column in a newspaper, saying the Stones are not musically professional, the guitar playing being amateurish. It�s a fARt!!! I wish the HTW chords last forever, simple and powerful. What makes Beethoven 5th Sym a masterpiece? The same chemicals, simple, powerful. �Are you ready for a little bit more! ?�, asked Mick before Keith triggered the powerful chords of this crown jewel, Satisfaction. The audience wanted it to last forever. Encore� then JJ Flash and confetti� � Nobody wanted to leave even the exit music was aired. Brilliant gig, the Stones haven�t even thought they are famous enough so they need not do much for the audience, and the fact is that they came out on stage and did 120% for the Harbour Fest. A modern fairytale. The bright full moon was watching over the huge Hong Kong skyscrapers, the South Chinese Sea and a rock 'n roll band setting stars in the sky with every note they delivered. A happy tale by the greatest of all: the Rolling Stones. Businessmen, tourists, local people, the still presidential Bill Clinton and of course we, the fans, were there to hear the true story of what music is all about. The everlasting story of president Mick, emperor Keith, king Charlie and prince Ronnie. The story that really makes a grown man cry! And we almost did, knowing that this was almost the end of the fantastic Licks tour, touching our deepest emotions, bouncing every single bone in our bodies and making us forget all possible problems we might deal with on 'normal' days. From the first kicks of Brown Sugar, into the fine string picking of Angie, the dirty licks of Can't You Hear Me Knocking, the gunfire of Street Fighting Man, all down to the constitution of Satisfaction. And then, like the law of every fairytale, the happy ending of Jumpin' Jack Flash. A Moonlight Mile from home, but it all felt so close.